The red-hot striker Ifeanyi Egwim of Rangers International FC, popularly called Enugu Rangers FC, has to be considered as a rookie in Nigerian football, having less than 10 matches in the Nigeria Premier League to his name. 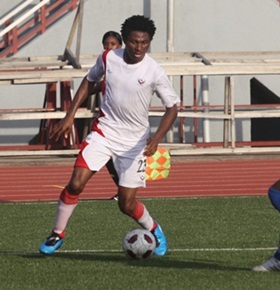 Despite his inexperience, Egwim is currently one of the most talked about players in local football. Egwim has been praised in Nigerian media and has been described as the new “attacking sensation” at Rangers International FC. It is almost impossible to find historic information about Ifeanyi Egwim. However, according to independent sources, Egwim was brought to Rangers from Prime FC. Prime FC is currently playing at second level of Nigerian football and is based in the city of Oshogbo, south-western Nigeria. As far as I know, Egwim was brought to the club as a backup striker. However, since Uche Nwofor (born 28.02.1989), the star striker of Rangers International FC, has been busy with the Nigeria U-20 national football team, Egwim has already gotten several chances in the starting eleven. Egwim has taken full advantage of his opportunities and has already scored five goals for his new club. * On 01.06.2011, Egwim scored his first goal in the Nigeria Premier League when Rangers won 1-0 against Sunshine Stars FC. * On 08.06.2011, Egwim scored one goal when Rangers won 2-0 against Bukola Babes FC. * On 19.06.2011, Egwim scored the last goal when Rangers won 5-0 against Liberian side Mighty Barrolle FC in the 2011 WAFU Club Championship. * On 13.07.2011, Egwim scored two goals when Rangers won 2-1 against Sharks FC. It is not easy to find information about Egwim’s style of play. MTN Football has described him as a player with “Ronaldinho-like step-overs”, referring to the Brazilian playmaker. I believe that Egwim can also play as an attacking midfielder / winger and that he is not a very physical player. The age of Egwim is unknown but he was recently described as a “teenaged bomber”. His name is commonly misspelled “Ifeanyi Egwuim”. Egwim has declared that he targets 10 league goals before the season ends. That may seem a bit ambitious but in any case, Egwim has made a great first impression at the highest level of Nigerian football. I’ve watched Egwim play. He’s more of a support striker, he’s also fantastic coming off the flanks (wings). He does not possess a breath-taking speed, and he atimes appears fragile, but his skill more than makes up for it. He always fearlessly runs at defenders. Presently i think he is the most creative player at Rangers Int’l FC, and one of the best in the league. But instead of constantly going on trials abroad, i’ll suggest he focuses a bit on Rangers to enable him develop even more and fight his way into the National team. But even with Egwim’s creativity, my personal favourite Rangers players are Ejike Uzoenyi and Haliru Umar who alongside Egwim are the fans favourite.